is Japan's second largest island; it is also the largest and northernmost of Japan's 47 prefectural-level subdivisions. The Tsugaru Strait separates Hokkaido from Honshu, although the two islands are connected by the underwater railway Seikan Tunnel. The largest city on Hokkaido is its capital, Sapporo, which is also its only ordinance-designated city.
. Hokkaido - Entries of this BLOG . Ezo refers to the Ainu people. "Deep Ezo" (oku ezo) comprises the island of Hokkaido and other islands to the north; see Kogo dai jiten (Shogakukan 1983) 241. Issa is celebrating Buddhism's spread all the way to the northern "barbarian" islands. "In 1779, the Japanese government started to govern the Ezo province, Hokkaido, which was inhabited by the Ainu race. The occasional contacts with Russian ships alerted the Japanese government, the Edo bakufu, of the potential threat from Russia. In 1802, a Russian envoy visited Japan, and, in the same year, the Edo bakufu opened an office in Hakodate in Hokkaido. In 1807, the government declared that the whole Ezo province belonged directly to Japan. This haiku (of 1812) reflects this history." This hokku is from the 5th month (June) of 1811, when Issa was living in Edo. Since the ancient period, the Yamato people had carried out military campaigns against the indigenous Ainu people, gradually conquering them and extending their rule to the northern tip of Honshu, the largest Japanese island. A few non-military settlements of Japanese were also established in the medieval period on the southern shore of Ainu Island (what is now called, in the language of the eventual conquerors, Hokkaido), and the first small Buddhist temple was built there in the early 15th century. These trading and fishing settlements grew, along with friction with the local Ainu, who sometimes staged small uprisings against the Japanese. In 1590 the Matsumae domain was formally recognized on the southernmost peninsula of Ainu Island, and the shogunate put the domain in charge of trading and fishing in the area. Trouble with the Ainu, whose land was being encroached on, continued, and in Issa's time several Russian traders and missions visited the domain, demanding economic and diplomatic relations with Japan, though the shogunate refused. Some Ainu converted to Buddhism, but the majority maintained their traditional shamanic religion. Issa is obviously aware of the spread of Buddhism on Ainu Island, perhaps because it was a topic among Buddhists at the time. 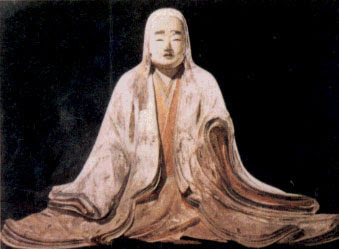 In the year after this hokku was written, Zenkoji Temple, near Issa's hometown, sent its statue of Amida with two bodhisattvas to the Matsumae domain for viewing by believers there. The tone of the hokku is reverent, and Issa seems to be amazed that Buddhism has spread even to the great island just to the north of Japan. Issa evokes the ceremonies on lunar 4/8, the traditional Mahayana date for the birth of Sakyamuni Buddha, when sweet tea is poured over a statue of the baby Buddha placed in a great bowl under a tiny roofed pavilion covered with flowers. Issa may be using this image to suggest that Buddhism itself is at last being born on Ainu Island in a major way. The implied "I" here does not refer to Issa but to any clear-eyed, objective Japanese visitor to Ainu Island, and the hokku is uncannily prescient in foreseeing the fate of the Ainu people who, especially after modernization began, were treated in much the same way Native Americans were in the US and elsewhere. Main festival at the shrine Hokkaido Jingu 北海道神宮. This shrine was built by the early settlers during the Meiji period to pray for a safe harvest and stable life conditions in the snowy country. Now the winter festival of the city is much more popular. is a Shinto shrine located in Sapporo, Japan. Sited in Maruyama Park, Chūō-ku, Sapporo, the Hokkaido Shrine enshrines four kami including the soul of the Emperor Meiji. A number of contributors of the Exploration in Hokkaidō such as Mamiya Rinzō are also enshrined. 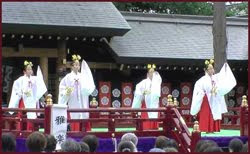 In 1869, by an order of the Emperor Meiji, a ceremony to enshrine three kami (Shinto deities); Ōkunitama, Ōkuninushi, and Sukunahikona, was held in Tokyo. They were enshrined as the three deities of the Hokkaido reclamation (開拓三神, Kaitaku Sanjin), and they were later moved to Sapporo by officers in the Kaitakushi, the previous government of Hokkaidō prefecture. An interim building of the shrine for three kami was constructed in 1870 in Sapporo, although its location was different from the current point where the Hokkaidō Shrine stands. 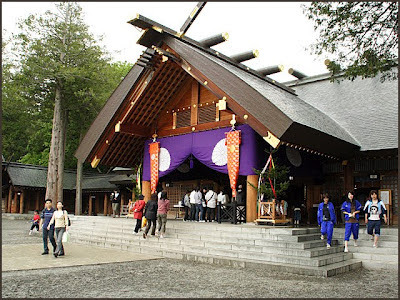 In 1871, the shrine was erected to the current place and named as the "Sapporo Shrine" (Sapporo Jinja), and on September 14 an inaugural ceremony was held. From 1889 through 1946, Sapporo-jinja was officially designated one of the Kanpei-taisha (官幣大社), meaning that it stood in the first rank of government supported shrines. The soul of the Emperor Meiji was newly enshrined to the shrine in 1964, and the building was officially renamed to the current "Hokkaido Shrine".The building was destroyed by the fire in 1974, and later restored in 1978. From June 14 to 16 in every year, the Main festival of Hokkaido Shrine, also called "Sapporo Festival" (Sapporo Matsuri), is held, and the line of people bearing Mikoshi parades down the street which leads to the shrine. It also manages a Scouting activities. God of the land of Hokkaido from which all things are able to be produced in nature. God of making and developing the land. God of healing who cooperates with Onamuchi to reclaim the land. 4. "God of Emperor Meiji"
Bronze statue of the head commissioner, Mr. Shima, who brought the gods on his shoulders and decided to choose the site of the present Shrine in 1869, and also planned the city of Sapporo. Few people lived i Sapporo at that time, but now, 1,640,000 people live in this city. 1. Festival of New Year (Jan.1st). Commemorates the first day of the year, praying for a peaceful world, for Japan, and the prosperity of the Imperial Household. 2. Festival of the parting of the seasons (Feb.3rd). Commemorates the beginning of spring and ceremony of praying for the coming in of good fortune and driving out all devils by throwing beans. 3. Commemoration of the founding of Japan (Feb.11th). 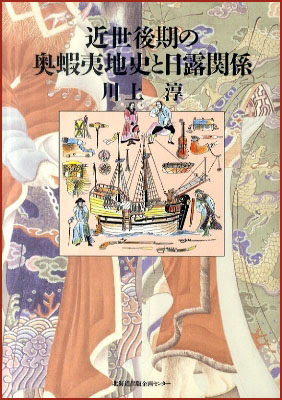 Commemorates the founding of Japan by accession to the throne of Emperor Jinmu, 2645 years ago. 4. Festival of praying for the fertility of crops (Feb.17th). 5. 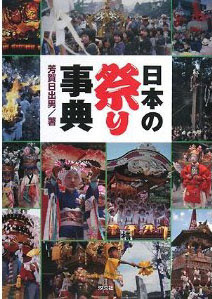 Main festival of Hokkaido Shrine (Jun.14th-16th). One of the 10 biggest festival in Japan, and the largest festival in Hokkaido (about 1,000,000 people). 6. The great purification ceremony (Jun.30th). Purifying sins, and recharging the spirit. 7. Festival of the Pioneers Shrine (Aug.15th). In honor of 34 men involved with the reclamation of Hokkaido. 500 children carry the portable shrines downtown. 8. Festival of memorial enshrined deities (Sept.1st). Commemorates the enshrining of the 3 dieties in 1871. 9. Festival of Meiji (Nov.3rd). Commemorates the birth of Emperor Meiji. Originated from the new rice festival, a festival to celebrate the first crop of the year, when the Japanese Emperor offers the new harvest of rice to the gods oh heaven and earth to thank them for the good hervest and to pray for future blessing. The Emperor himself eats the fresh rice in private with the gods. 11. Festival of present Emperor's birthday (Dec.23rd). Offering the present Emperor our hearty congratulations for his long life. 12. The great purification ceremony (see Jun.30th). Purification before welcoming the new year. Every month the 1st, 10th, 15th and 20th at 10a.m. prayers for a peaceful world and for Japan, for the prosperity of the Imperial Household and Hokkaido. source : Hokkaido Jingu Homepage .
. Food from Sapporo . ***** . Amulets from Shrine Hokkaido Jingu . Candle art is usually held on a Saturday in early August, and features a display of over 10 thousand candles. Every year a different picture is painted, using candles, on the hillside in Canadian World Park. In spring, herring start appearing off the coast of Hokkaido. During this season, many fishermen and poor farmers from Hokkaido and Northern Japan assembled at the homes of the local "fisherman master" (amimoto) to help with the seasonal fishing activities. In recent years, this custom has almost died out thanks to different fishing equipment and other influences of modern life.